The British liner Arandora Star, carrying 1,500 German and Italian prisoners of war to Canada, is sunk by U-47 off the west coast of Ireland, with many casualties. Hitler orders preparation of ‘Operation Sealion’ the plan for the invasion of Britain. Germans issue casualty figures for French campaign: 17,000 killed and 1,900,000 French prisoners claimed. August Bank holiday canceled in Britain. The RAF carries out night raids on Bremen and Cologne. Troops of the German 11th, Romanian 3rd and 4th Armies begin an offensive from Moldavia toward Vinnitsa and the Black Sea port of Odessa. Allied convoys QP-13 and PQ-17 pass each other while the German battleships Tirpitz and Hipper prepare to attack PQ-17 in the North Atlantic. The British hold El Alamein despite heavy attacks, Rommel is now down to 26 tanks. JCS approves Pacific strategy-a dual Army-Navy attack. hurchill’s government overcomes a parliamentary Motion of Censure in an overwhelming vote. US Depression-era Civilian Conservation Corps is ordered disbanded, completed 30 June 1943. Greek guerrillas to come under the direct control of the supreme allied command in the Middle East. U.S. Fifteenth Air Force, raids three airfields in southern Italy. US troops land on New Georgia in the Solomons. The end of the battle of the ‘Scottish Corridor’ in Normandy result in the German counter-attacks failing to eliminate it. Field Marshal von Rundstedt, C-in-C West, is replaced by Field Marshal von Kluge. The Russians cut the railways to the West of Minsk. 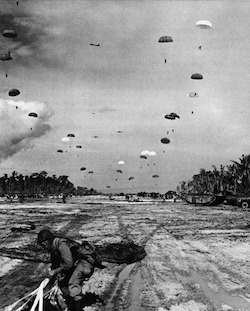 US Army troops land on Noemfoor Island in Geelvink Bay, New Guinea. US Marines take Garapan, Saipan; Japanese fall back to final defensive line on northern Saipan. The U.S. submarine Trenchant sinks a Hagura Class Japanese cruiser in the Southwest Pacific. The British capture secret documents concerning a planned breakout of Honda’s 33rd Army in Burma. USS Barb attacks Kaihyo Island with the first use of rockets by a sub against shore installations.